I have to share with you all how wonderful my sisters and their children are. I always knew these girls were sweet but this brought a tear to my eye. Let me start with I haven't mowed my yard in the past few weeks so the leaves and the grass was out of control. 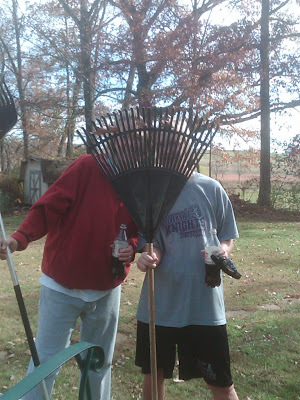 I finally was going to get a day off on Saturday and all I got to do was yard work. Well on Saturday my sisters asked if I wanted to walk around the square with them and look for deals and sales. (Host of Christmas Past was in town) Well I ended up eating with them before we left for town and my littlest niece was dying to tell me something. They all acted like it was a Christmas present they had bought for me that day. Well they finally got her to not talk about it again until the meal was over. We were standing outside and she (the little one) came over to me and wanted me to hold her. I could tell she was still dying to tell me something. She held it in as long as she could and then she told me that she along with her cousins had "rolled my grass." A few weeks ago I took another niece to go rolling and we rolled my sisters house so I just thought this was payback. Well after that I was dying to go home and see just how bad my yard was. I had been at work all day so they had plenty of time to get me really good. They were even talking about throwing rolls over the house. So I went home and they followed me to pick me up to go to town. When I got home there was no toilet paper, there was nothing. I was so confused. My sister popped out of the car and said "oh just check the backyard" That is when I figured it out. (I hadn't slept in 36 hours at this point, that's why I was so slow) When I looked in the backyard, there were no leaves, and the lawn had been mowed. I was super excited. This meant I got to sleep the next day!!!!!!!!! 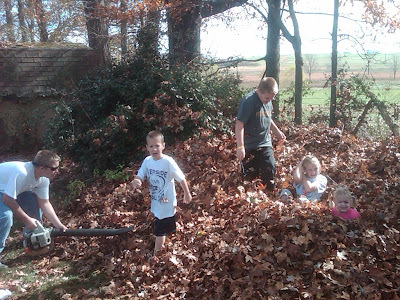 Well on top of them cleaning up my yard, they also came back over the next day and helped clean out the gutters. YOU GUYS ROCK!!! 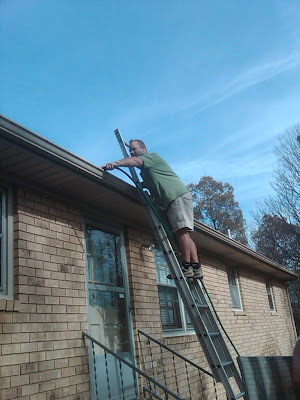 Keith cleaning out the gutters. 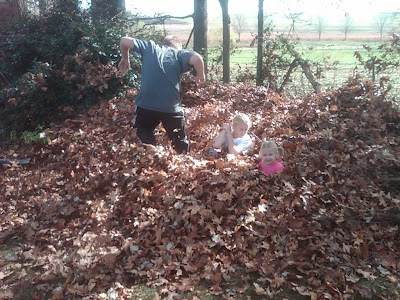 The children loved the leaves, they played in them the day that the girls did all the work and then they played in them again during the gutter clean out. That is so awesome Emily! What a sweet family you have. 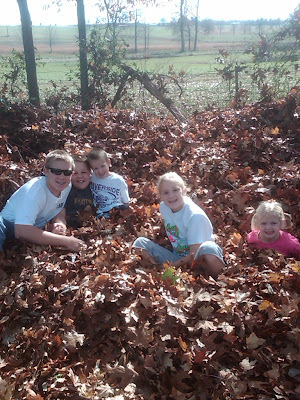 They must really love you cause that looks like a TON of leaves!